Here’s my story of how I got to this amazing university. It was May 2009 when I came for the first time to Mercyhurst for my sister Gabriela Delgado’s graduation. I fell in love with the campus. The people were warm and welcoming. It was then that I realized this was the right place for me, and indeed it was. I am currently a junior, Communication Major with a minor in Marketing. So far, my experience at Mercyhurst has been wonderful. I encourage you to choose Mercyhurst; this is the right place for you. When I came to Mercyhurst University last fall I thought I would face many difficulties, especially because there was no other current student from my country nor who spoke my first language. However, I have only had great experiences so far. The faculty is always there to support all students and make them feel at home. That is the reason I consider this wonderful campus my second home. So, If you are seeking a place in which you are going to improve academic skills while having an awesome time, Mercyhurst University will certainly be a great option! What do I love about Mercyhurst? The amazing people on campus and the acclaimed learning environment, where intellectualism is honored and infinite opportunities are abundant, have given me an enduring lifelong benefit. Mercyhurst was indeed the right choice. Bereket is the vice president of Mercyhurst's International Students Organization. Being the first ever student from my country was probably the scariest thing about coming to Mercyhurst. However with time I became proud of this fact. Everyone that l meet was excited to hear about my country and what it was like growing up there. What l learned is that at Mercyhurst every International student is a considered a treasure and everyone is warm and welcoming and not only ready to teach you but also to learn from you. If you are looking for new experiences and to make great memories you should definitely come to Mercyhurst. Being an ambassador means going through a long nerve-wracking process of 2 paper tests, 2 interviews, 1 speech, 1 solo tour and some other events. It means having the awesome green jacket which allows me to walk in Egan dining hall without swiping. It means giving a practice imaginary tour during the snow storm in the MAC, trying to picture the whole campus in my head and talk to myself, pretending I am talking to a real family (don't let people see it though). Being an ambassador means giving a tour right at the moment when my family and friends back home were celebrating Lunar New Year's Eve. It means getting to know lots and lots of students and parents, listening to their stories and sharing my own. Being an ambassador means the happiness of giving back to my school and helping some high school students to make one of the most important decisions in their lives. Growing up in Mainland China, Yuhao Yang’s world view was limited. He longed to see, feel and learn more. He wanted to experience freedom and democracy and to understand policies, politics and issues affecting other countries. Coming to Mercyhurst University four years ago gave him all that … and more. 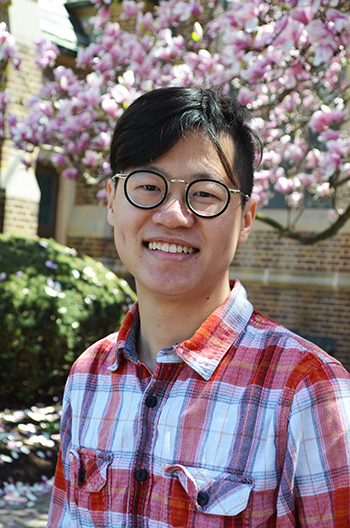 Following his graduation from Mercyhurst on Sunday, May 13, Yang will head to University College London to pursue his Master of Science in Global Migration. What he finds fortuitous is that he will be there when the United Kingdom officially secedes from the European Union in 2019. Read more about Yuhao.